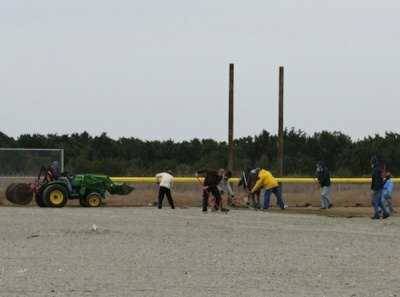 As of December 20, 2014, around lunch-time, the outfield was almost completed. 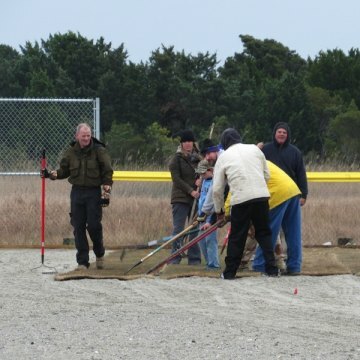 The volunteers who came to help lay the sod successfully placed about 60 rolls on the field during the day, and once everything is said and done, a total of 280 rolls of sod will have been used to grow grass on the field. On the far side of the Park, beyond third base, a soccer pitch will be formed, giving the successful soccer team a great place to practice and play. If the winter isn't too rough and the sod is able to root into the sand, the Community Park could open as early as February 2015. If the weather is not kind, which will prevent the sod from rooting and growing, the projected opening date is May 1, 2015. 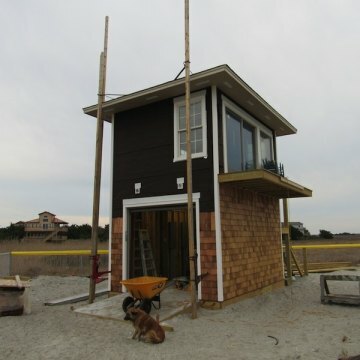 A great amount of progress is being made on Ocracoke's Community Park, a project of the non-profit Ocracoke Youth Center. So far, about $1 million has been raised or donated to the effort, allowing the purchase of the property, sod, fencing, a multi-use score board, and construction of the Press Box and dug-outs to be made possible. Volunteers have been working whenever truck-loads of supplies arrive on the island, and they work through sunshine, wind, and rain. 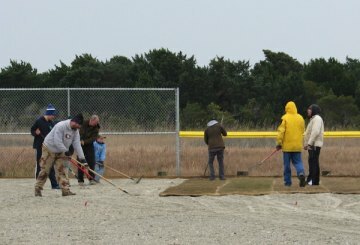 Ocracoke Community Park volunteer and Ocracoke Youth Center board member Bob Toth said there are about 15 volunteers who show up regularly to help, many times going in shifts throughout the day. "We're doing it on our own as a community," Bob said. He went on to explain how contractors came to put in the fencing surrounding the park and built the dug-outs and Press Box. 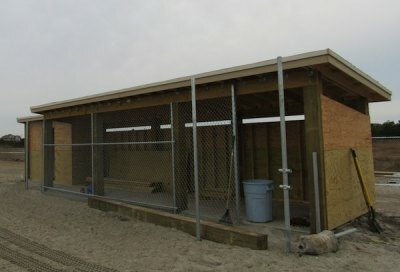 Ocracoke resident Tommy Barnette has donated sheet rock, other materials, and time to the project, helping to complete the interiors of structures in the Park. The Community Park will be a great spot for sporting events and concessions, but Toth and groundskeeper Danny Worsley talked about the field area also being a venue for outdoor concerts, festivals, and celebrations. Plus, plans for an Activity Center are in the works. Completion of that project is still three to five years away, but once ready for use, the two-story building will be utilized as a Senior Center and reception hall, among other things for the community's benefit. "This whole Park is for the kids, for the community, for everyone to use. And we've gotten such support," Toth said. Numerous donations have been made; The Outer Banks Community Foundation, private donors, aide from the Occupancy Tax Board, and community fundraisers have accomplished quite a lot. A golf cart, donated by long-time resident and businessman John Giagu, was raffled off and raised $19,300. All proceeds went to the Community Park project. The OYC board is grateful to the many, many individuals and businesses that have contributed in ways large and small, from cash donations to fundraisers. Two examples are Gaffers, a local sports bar, which recently hosted a holiday fundraising event to benefit the Park, and Martha Garrish, who donated $8,000, which was raised during her wedding anniversary celebration. "We have very generous people," Toth said. 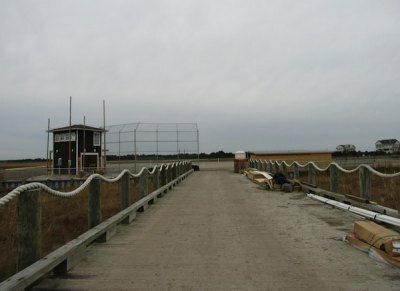 The land for the Community Park is surrounded by and built in a wetlands area, but because of dredging efforts and the placement of bulkheads, the field should remain safe from flooding caused by severe weather. As a result of many wetlands areas being protected, a trade-off was made. 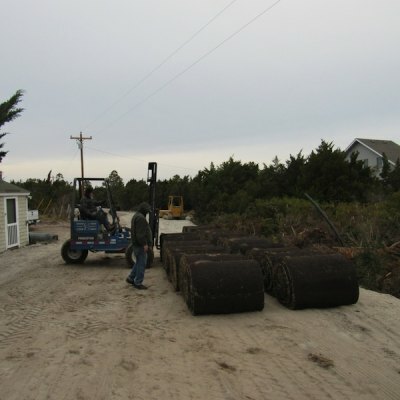 In order to keep a balance, areas behind Ocracoke's gas station, the Beachcomber, were deemed protected in order to make up for what was being used for the Park. This exchange of land allowed the Park project to be approved. "There's no net-loss of wetlands," explained Bob Toth. "The land was privately owned, and we did not take any Federally protected land for the project." An elevated walkway to and from the field through the wetlands area is also being planned. "It'll have to be three-feet above the marsh," explained Vince O'Neal, volunteer and President of the Ocracoke Youth Center. He went on to talk about the Coastal Land Trust – the same organization that protects Springer's Point – and how that group will help to insure the walkways are built correctly and in an environmentally-friendly way. While the Community Park is well on its way to being a functional baseball field and soccer pitch, about $1.3 million is still needed in order to complete every desired aspect. Donations can be made at any time and are greatly appreciated. Also, anyone who wants to volunteer is welcome to join the effort. Trucks full of materials will be arriving on the mornings of December 23, 24, and 25, so anyone willing and available to help can go to the Park on any of those days. After we ring in 2015, Vince and Bob are hoping to have a large number of volunteers come to help complete the dug-outs and Press Box. Anyone with carpentry skills would be a great help to those projects. For any updates on volunteering or the Community Park in general, check out Facebook page. For some background on the development of the Park, check out this article from 2012.